Researchers at the University of Tokyo have made a "breathable" nanoscale mesh with an electronic sensor that can be worn on the skin for a week without discomfort, and could potentially monitor a person's health continuously for long periods. A hypoallergenic, electronic sensor can be worn on the skin continuously for a week without discomfort, and is so light and thin that users forget they even have it on, says a group of Japanese scientists. The elastic electrode, constructed of "breathable" nanoscale meshes, holds promise for the development of non-invasive e-skin devices that can monitor a person's health continuously over a long period. Wearable electronics that monitor heart rate and other health signs have made headway in recent years, with next-generation gadgets employing lightweight, elastic materials attached directly to the skin for more sensitive, precise measurements. However, while the ultrathin films and rubber sheets in these devices adhere and conform well to the skin, their lack of breathability is deemed unsafe for long-term use: dermatological tests show the fine, stretchable materials prevent sweating and block airflow around the skin, causing irritation and inflammation, which could lead to lasting physiological and psychological effects. "We learned that devices that can be worn for a week or longer for continuous monitoring were needed for practical use in medical and sports applications," says Professor Takao Someya at the University of Tokyo's Graduate School of Engineering. His research group has previously developed an on-skin patch for measuring oxygen in blood. 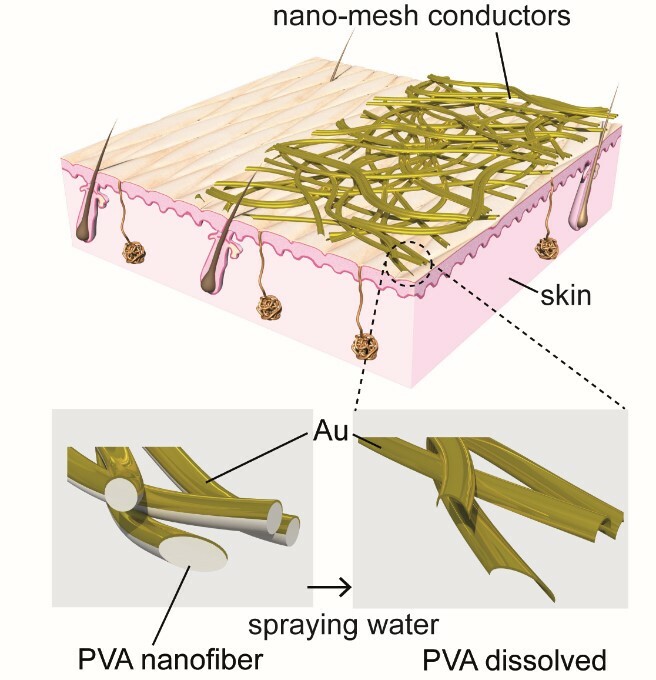 In their latest research, they developed an electrode constructed from nanoscale meshes containing a water-soluble polymer, polyvinyl alcohol (PVA), and a gold layer – materials considered safe and biologically compatible with the body. 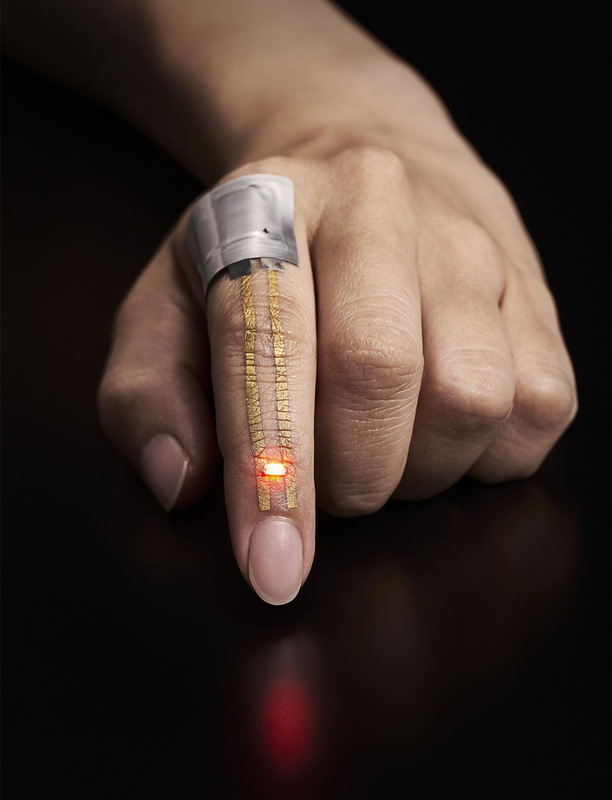 The device can be applied by spraying a tiny amount of water, which dissolves the PVA nanofibres and allows it to stick easily to the skin – it will conform seamlessly with curvilinear surfaces of human skin, such as sweat pores and the ridges of fingerprint patterns. The researchers conducted a skin patch test on 20 subjects and detected no inflammation of skin after they had worn the device for a week. The group also evaluated the permeability, with water vapour, of the nanomesh conductor – along with those of other substrates like ultrathin plastic foil and a rubber sheet – and found that its porous mesh structure exhibited superior gas permeability compared to other materials. "It will become possible to monitor patients' vital signs without causing any stress or discomfort," says Someya about the future applications. In addition to nursing care and medical uses, the new device could enable continuous, precise monitoring of athletes' physiological signals and bodily motion without impeding their training or performance. The team's research is published this week in Nature Nanotechnology. 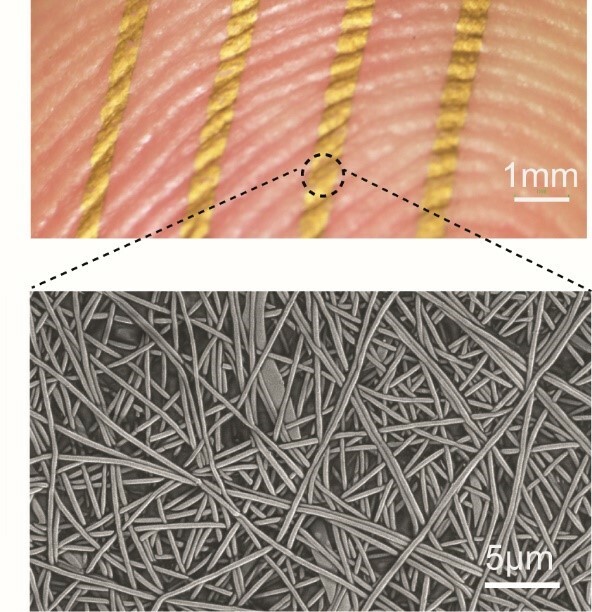 of a nanomesh conductor on a skin replica, bottom. Credit: 2017 Someya Laboratory.